We want everyone who calls Hamilton home, or visits our city, to be safe when using our streets and roads. That means in our busy city we need the right speeds on the right roads for all, whether walking to the shops, biking to school, driving to work or making deliveries. As a city Hamilton has a Vision Zero goal for road safety – we don’t believe any loss of life on our streets and roads is acceptable. We’re also a growing city, with more than 20,000 extra people expected to call Hamilton home in the next 10 years. One of the ways we can make our streets safer is by better managing the speed people travel around the city. We’d like your feedback on our plan to do this. 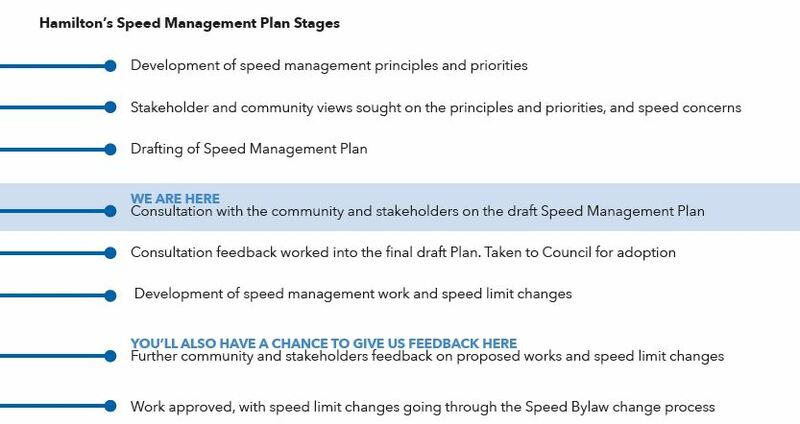 In late 2018 we started working on a Speed Management Plan for Hamilton. We held workshops with people and groups involved in road safety, including the Police, AA, city councillors, and the Transport Agency to develop some principles of speed management. We asked you what you thought of these ideas. We also asked you to tell us where you thought speed on our city’s roads was unsafe or not right. You shared your views with us online, on social media, via library displays and at the Treats in the Park event at Western Community Centre. We received 200+ comments across online channels, 500+ “pin drops” on maps. These have been used to draft a Speed Management Plan for Hamilton which we want your feedback on. This would replace the Council’s current Speed Management Policy. Overall you were in support of better managing speed in our city. You also told us making sure people drive at safe and appropriate speeds is about more than just speed limits – there’s also road engineering and infrastructure, education, community engagement, and enforcement. Some people said they didn’t want any reductions in speed limits and would like all roads to be faster. Using the feedback from you and stakeholders we’ve developed principles to guide the work we do and what we’ll give priority to. We’ve also developed these in line with the NZ Transport Agency’s Speed Management Guide and the Government’s Safer Journeys road safety strategy, to make sure all risks on roads and the different uses of roads are considered. Using these principles, along with tools provided by the Transport Agency, a speed management vision for Hamilton has been prepared. How and when we deliver this will be worked out using the priorities above and alongside national speed management work, such as changes needed to bring in 30km/h speed limits outside schools. When changes are planned, the Council will engage with stakeholders and the community.